The Sharon-Brush is a self-contained carpet cleaning machine with rotating brush, designed for professional cleaning of small areas of carpet and hard floor. A special device allows to switch from carpet to hard floor cleaning by simply turning a knob. 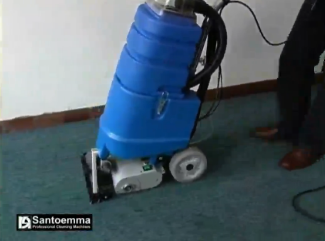 The rotating brush, with automatic pressure adjustment, is able to deep clean both very dirty carpet and hard floor. 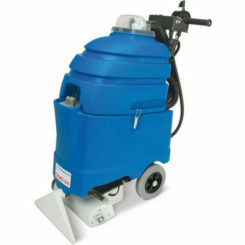 Its small width (only 29 cm) allows the machine to be used also in very narrow rooms. 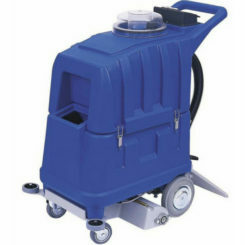 The water-flow can be adjusted for a maintenance low-moisture cleaning or a restoration deep-cleaning.It is possible to connect the hand tool NS10PN to the machine, for cleaning armchairs and hard-to-reach spots. Sharon-Brush is indicated also for the hiring to private users thanks to its strength and its ease of use. Its professional features make Sharon-Brush suitable also for cleaning companies.Main application fields: cleaning companies, hotels, restaurants, clubs, pubs, offices, banks, shops, rental companies, private houses, carpet shops, trains, busses, planes, cinemas, theatres, ferry boats, ships, hospitals, nursing homes, fitness centres, schools, universities. 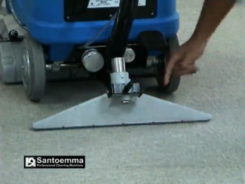 It is possible to clean both carpet and hard floor with a single machine. 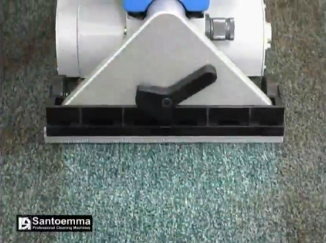 The commutation from carpet to hard floor cleaning and vice versa is done easily, simply turning the lever on the vacuum head. 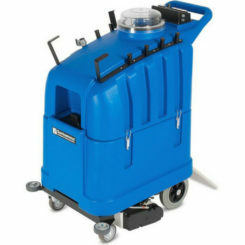 Reduced width (only 29 cm) for professional cleaning even of small surfaces of carpet and hard floor. Powerful and reliable brush motor which allows a deeper and faster cleaning. Possibility to push the machine forward on hard floor without lifting the vacuum head thanks to proper support wheels. The machine is light and easy to carry. Vacuum head in die-cast aluminium,? practically indestructible. Plastic and rubber handles, which avoid the cooling of the worker?s hands. The height of the handle is adjustable so that it can be regulated according to the stature of the worker. 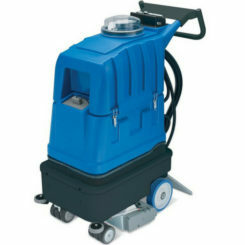 Water spraying can be operated simply turning the handle of the machine. Quick disconnect spray nozzles, which can be replaced by hand: the nozzles can be cleaned easily and without using any tool. Automatic adjustment system of the rotating brush pressure according to the kind of carpet. The hand tool NS10PN-M, supplied as standard, allows to clean hard-to-reach corners. Transparent unbreakable cover, which allows to see the dirt while vacuuming. Recovery tank easily detachable from the machine body, in order to make the tank emptying and cleaning easier. The filters of the vacuum motor are easy to reach and removable for an easy cleaning. The gasket are not glued and replaceable by hand. Easy to clean and change. Water pump with bypass, which allows the automatic regulation of the optimal water lift according to the tool used. Moreover, the bypass device makes the pump more reliable and avoids problems in the years. Pump built on Santoemma specifications, for lasting long. Brush motor with thermal protection against overload. Modular design that makes the maintenance easier. The maintenance of the machine can be done really at low costs. .